The only people who made it through Trump’s State of the Union Address without at least grimacing and a hint of nausea were those right-minded folks who didn’t watch. Before the speech, we wondered whether we would get the sedated “Teleprompter Trump” or the unhinged “Twitter Trump.” Alas, he remained calm — albeit deranged — and had a disingenuous, conciliatory tone as he pleaded for unity. Vice President Pence sat behind Trump, to his right, locking his starry-eyed gaze on the back of his boss’ empty skull. An intriguing piece by The New York Times’ Katie Rogers delved into Trump’s “conspicuously sun-kissed glow, one that has shone like a stoplight against Washington’s graying backdrop. Much like Warhol’s shock of white hair or Big Bird’s saffron plumage, the president’s vibrant hue is so consistently present and meticulously maintained that it was a culturally embedded representation of him long before he entered politics. 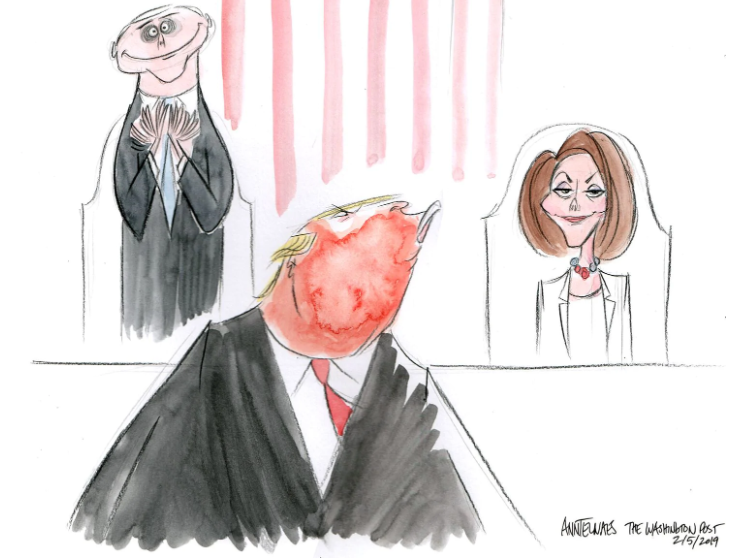 The president’s shade is one that Alec Baldwin, the actor who portrays Mr. Trump regularly on “Saturday Night Live,” recently described as vacillating between a “Mark Rothko orange” and a “slightly paler Orange Crush,” depending on the setting. Which right now is February in Washington. “Which is not in the tropics last I checked,” Mr. Baldwin said in an interview. It was a big week at the NDP as we welcomed veteran political operative Jim Rogers as our new executive director. 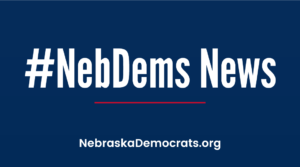 “Jim has a deep understanding of Nebraska’s political landscape and respect for party operations,” said NDP Chair Jane Kleeb. “His leadership and skills are huge assets as we head to the 2019 City of Lincoln election and the 2020 campaign season. Rogers, who most recently worked on the Jane Raybould for U.S. Senate campaign, was executive director of the NDP from 2009 to 2013. He also was political director for Brad Ashford’s successful 2014 campaign for Nebraska’s 2nd District congressional seat and then served as Ashford’s outreach director. Joe Ricketts, father of Gov. 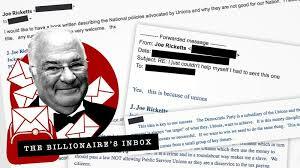 Pete “Gosh My Dad’s Rich” Ricketts, stepped in it and was forced to publicly apologize after The New York Times and other media outlets wrote about emails he sent that focused a fear of Muslims and contained conspiracy theories about former President Barack Obama, among other things. He also routinely indicated that he had been amused by the racist jokes sent to him by others, deeming one where the punchline was a racial slur to be a “great laugh,” according to the Washington Post. All this prompted NDP Chair Jane Kleeb to demand that the Nebraska GOP, U.S. Reps Don Bacon and Adrian Smith, Sen. Ben Sasse and other Republicans return the thousands of dollars in donations they got from the billionaire. 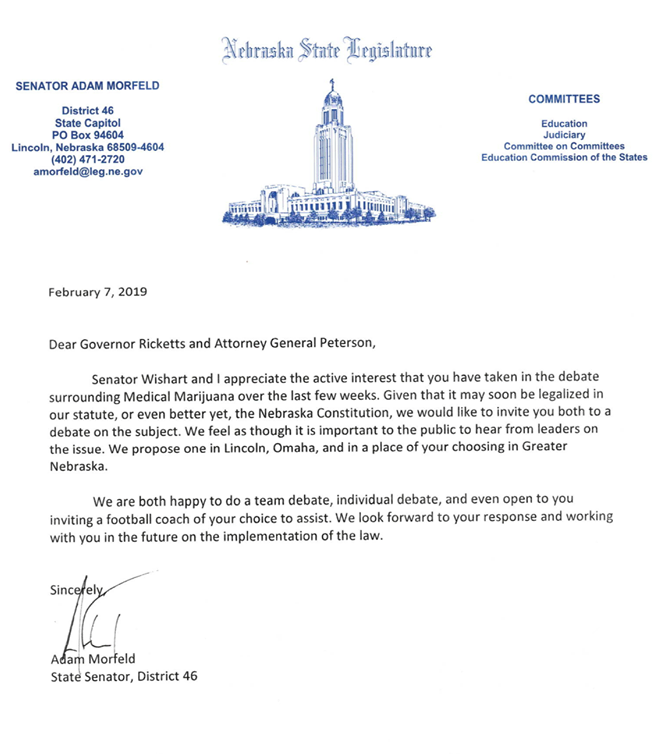 Lincoln Sen. Adam Morfeld issued an invitation to the “governor and attorney general (and a football coach of their choosing! )” to debate medical marijuana with him and Sen. Anna Wishart. The parenthetical reference was to former Nebraska football Coach Tom Osborne, who testified against the medical marijuana bill, which would allow doctors to prescribe cannabis to patients for a list of approved medical conditions. Farewell to Ann Boyle, former NDP chair and Public Service Commissioner. She was a true Democrat and great public servant. She blazed a trail for women in politics. She is already missed. Visitation will be from 9 to 11 a.m. Saturday, at Heafey Hoffmann Dworak & Cutler Mortuaries, 7805 West Center Road, Omaha. Her funeral services follow. We finish by revisiting the Axios leak of Trump’s executive schedule, which showed the president* increasingly insists on unstructured “Executive Time” — leaving him alone with his “thoughts,” which is horrifying in and of itself. Some days, Executive Time totally predominates. For instance, he had one hour of scheduled meetings on Jan. 18 (with acting chief of staff Mick Mulvaney and Treasury Secretary Steve Mnuchin) and seven hours of Executive Time. The day after the midterms, Trump’s schedule had 30 minutes for a chief of staff meeting and more than seven hours for Executive Time. This did not go unnoticed by Esquire’s Charles Pierce, whose disdain for all things Trump is legendary — and most understandable. If you were a disgruntled employee of an utterly dysfunctional operation, and you wanted to revenge yourself on the incompetent at the top of the company depth chart, you might arrange for the wide world to know that the incompetent in question is also a very lazy slug who could care less about the obligations of his job. Welcome to the United States Government, Executive Branch Division. This is an astounding lack of institutional loyalty and a whopping piece of professional sabotage. Down at Camp Runamuck, also according to Axios, they’re running scared, wondering whence the next knife in the back will be coming. We are getting to the point where people who want careers in government after this all passes will start to burnish their relationships with their media pals. This is going to get Borgia ugly. Food tasters are going to get rich.